I am a firm believer that some days you just need to have ice cream for lunch. After all, summer and ice cream are a perfect match. I have fond memories of going to the small local ice cream shop on a hot summer evening with my parents. As a grown-up, ice cream still makes me smile. 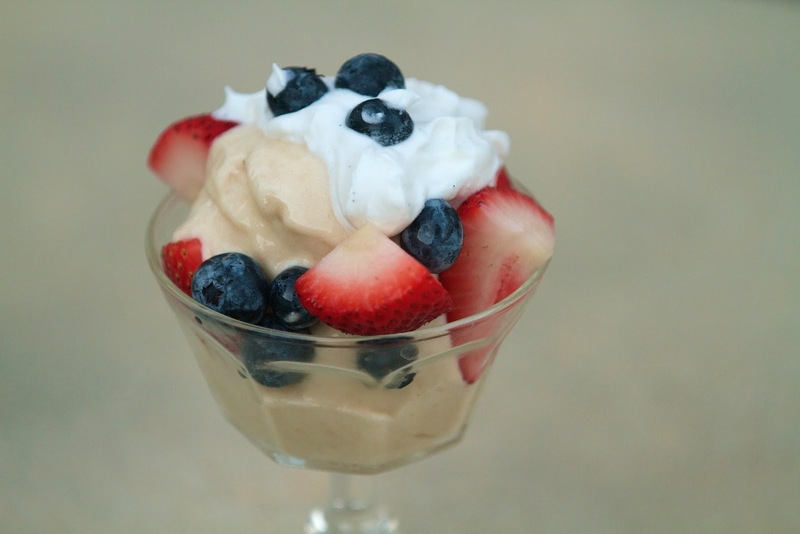 So, what better way to celebrate these sunny summer days than with an ice cream recipe. The thing is, this “ice cream” contains no dairy or additional sweeteners. It’s fruit. Just fruit. Bananas. Strawberries. Blueberries. Topped with a little whipped coconut cream, it’s a sweet treat that's pretty darn perfect for a guilt-free ice cream for lunch situation. Oh, and let's face it, I say the recipe serves 4, but you and I both know that's not going to happen. You're totally going to eat it all. Peel two ripe bananas and cut into small pieces. Spread the pieces out on a freezer-safe plate or cookie sheet. Freeze for 2 hours or overnight. Refrigerate a can of unsweetened coconut milk for a few hours or overnight. Blend the frozen banana pieces in a small food processor or blender. Keep blending, occasionally stopping and scraping down the food processor. The banana will go from looking crumbly to gooey, to oatmeal-like and then it will become creamy, life soft-serve ice cream. When it reaches the creamy stage, blend for just a few seconds more. You can serve immediately, but it’ll be very soft. For a more traditional ice cream texture transfer it to an airtight container and freeze until solid. While the "ice cream" firms up, make the whipped coconut cream: Flip refrigerated can of coconut cream over and open from the bottom. Pour out any liquid and save for use in a smoothie or another recipe. What remains in the can is the cream. Scoop 1/3 cup of the solidified cream into a bowl. Add the vanilla. Using a hand mixer, stand mixer, blender, or a whisk, whip the coconut cream until soft peaks form. It won't be as fluffy as traditional whipped cream, but the texture will become whipped-like. Keep the whipped coconut cream chilled until ready to use. 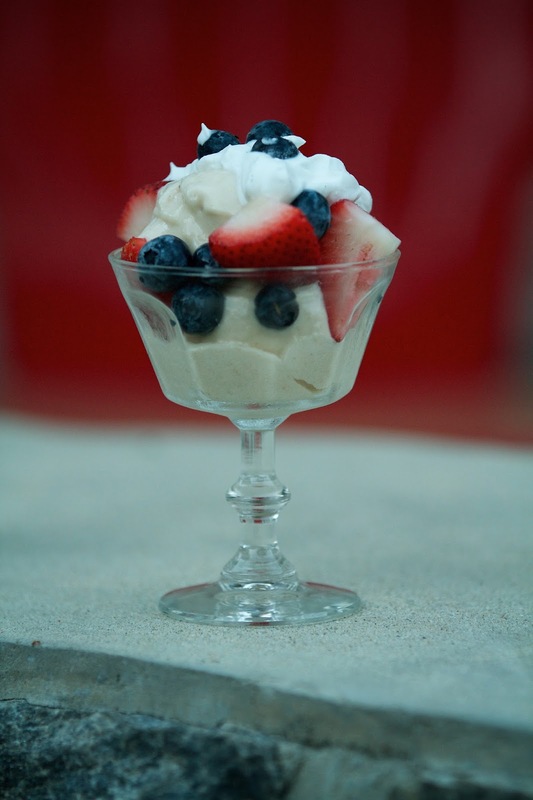 Once the “ice cream” is frozen, scoop into small bowls, sprinkle chopped strawberries and blueberries onto each serving, and add a dollop of whipped coconut cream on top. Any extra whipped coconut cream will last covered in the refrigerator for a few days.